I guess that by now you’re wonder-ING why I’m writ-ING in such a strange way? Well, when I read that the tangle ING is this week’s Diva Challenge Laura Harms had prepared for the tangl-ING world, I just knew I had to play. I really like ING although I hardly use it in my work – I wonder why? Maybe from now on it’ll show up more often because once I started tangl-ING, I just couldn’t stop! 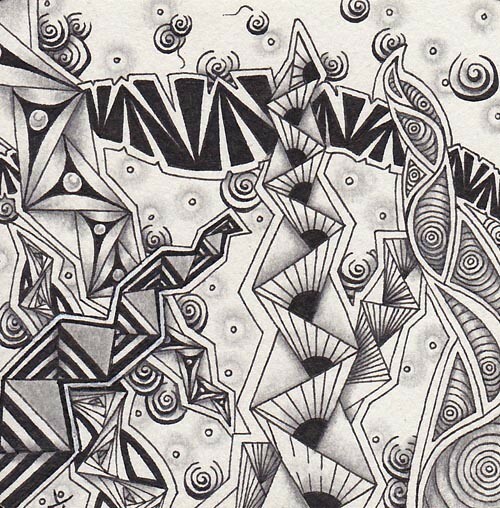 ING is such an addictive and really cool tangle that offers so much space for variations. If you haven’t already tried it, please do! This tangle really deserves to be tangled more often. This is a good example of me clutter-ING… I tried to overlap, but to me it looks only cluttered, too full of to much detail and the effect I wanted to get, which is that ING is sucked towards the center, is not eally visible. In the actual tile it looks even more like that than here. Maybe that’s because it is a scan? I don’t know but I hope that Eni Oken’s new ebook on Overlapp-ING will help me to improve here! Tangles used: ING, Printemps, Flux, Tipple, Cubine, Paradox, DL Sunray, and some fragments I invented. Here I tried the exact different th-ING than with the last tile, ING was supposed grow from one spot in a star-like shape. I think I like this tile best, it’s not cluttered and has some interst-ING contrasts and fill-INGs – especially like that triangle-fill-ING in the lower left! Only now I noticed taht I forgot to shade Printemps. 😀 I’ll leave it like that, it’s not too bad like that. On this tile I used ING, Knightsbridge, Printemps, River, Zedbra, Paradox, DL Sunray and Tripoli. If you liked my contributions I’d like to hear about that! And please do check out all the other great contributions tanglers from all the world have linked for the Diva Challenge! Now I still have some wedding-related things to do, but I said I wanted to start posting again here in August and here I am! 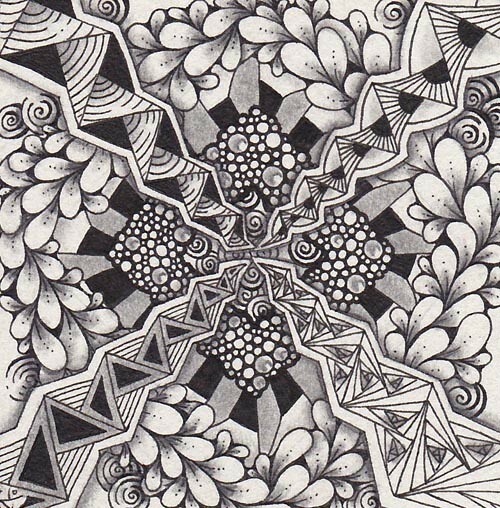 Actually I wanted to start with some artwork, but today I stumbled upon a post by Anya Lothrop CZT on her German blog and I just had to write about it here. 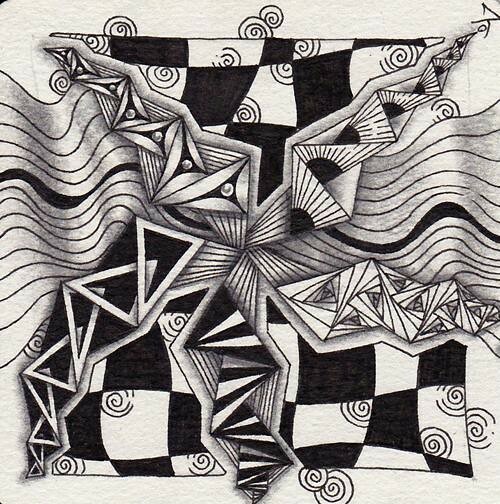 The post was about her recent trip to Japan and the state of Zentangle in this intriguing country. Even if you don’t know any German, do visit! The pictures are very nice. 🙂 I myself am a big fan of Japan and have been there only last year on a nearly four week vacation. Well, vacation isn’t quite the correct term, since both my now-husband and I went there to study Go, an ancient board game both of us really enjoy (studying Go is fun most of the times but it can be tiresome and feel like work, too). 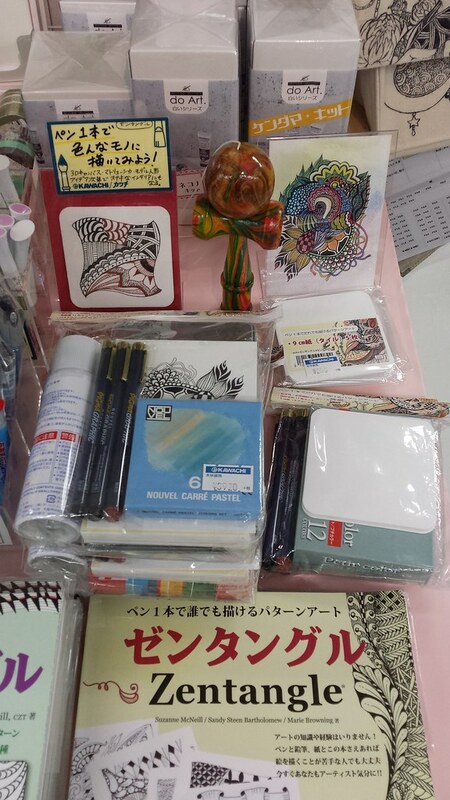 I have no idea what the colourful kendama is doing there in the middle if the Zentangle supplies! And a close-up of the books – I assume you are familiar with the original versions of these books? Isn’t it amazing how different they look? What about you? 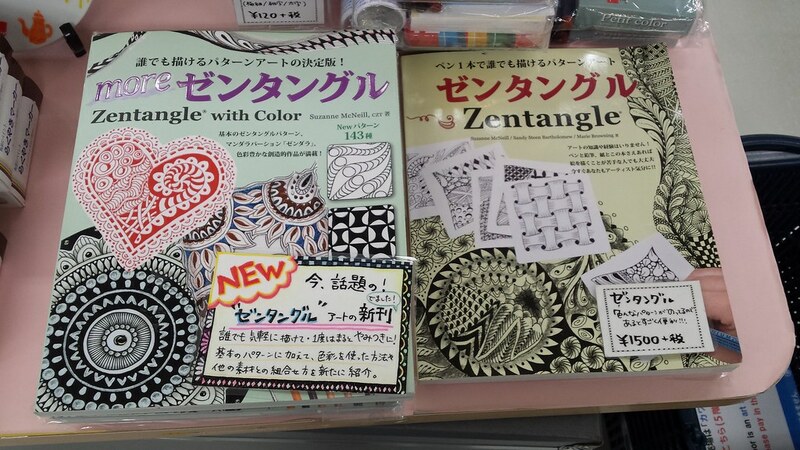 Have you already found Zentangle books or supplies in your vacation abroad? If so, I’d love to read about it!